Bozeman's Tattoo Alley, L.L.C., Custom, Freehand, and Realistic Tattoos, Your Design or Ours! The store at Bozeman's Tattoo Alley L.L.C. 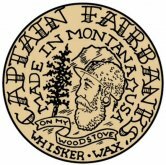 lets you purchase your BTA goodies like shirts and stickers on line, as well as fine tattoo care and beard care products from Captain Fairbanks!